Human social behaviour is incredibly difficult to model. 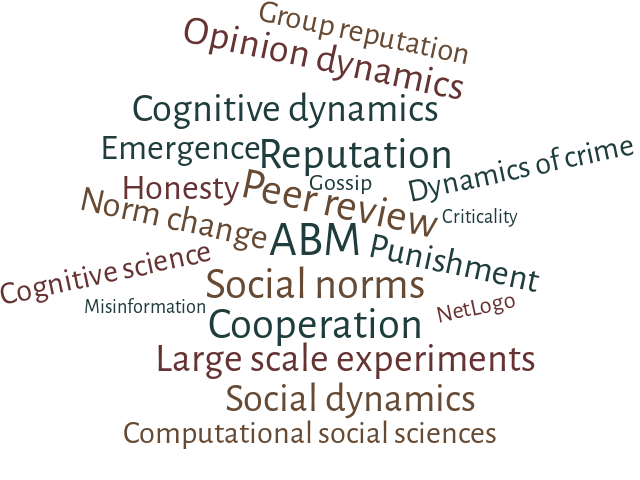 Simulating society is one of the main challenges of Agent-based modelling (ABM), which aims at reproducing some aspects of social life with computational models. At the individual-level, people possess heterogeneous characteristics, values, goals and attitudes. They are also subject to different norms of behaviour, and possess foresight and decision-making capacities to choose what to do. At higher macro- and meso-levels, institutions and societies are social artefacts that endure over time and affect the people within them. Yet this is not all: societies and institutions are built upon the individual interactions of people, and institutions can act back on individuals’ behaviour. Agent-based modelling (ABM) is a set of techniques that allows researchers to represent this complex set of agents, interactions, and dynamics. In contrast to traditional theory, ABM is more precise, forcing researchers to explicitly state their assumptions, ensuring that there is internal consistency in the theory, and allowing reproducibility, while in contrast to analytical mathematical approaches ABM can be applied to more complex settings. Broadly speaking, modelling means building a representation of social reality; developing agent-based models means taking into account the heterogeneity of individuals or agents, with their behaviour ranging from reactive to autonomous and cognitive. Instead of reducing reality to a few variables, ABM tries to replicate reality and its randomness at the level of its individual components. Such models are common in weather prediction, or city transport planning; ABM has already proved to be useful in several societal and economic issues, such as traffic, social norms dynamics, crime, opinion dynamics, information diffusion, reputation. Since its establishment, the LABSS is following this path, reproducing virtually the main components of a society – from individuals to their institutions – and recently has also started combining the ABM methodology with real-world experiments. This approach contributes to the understanding of many micro and macro dynamics of social life, bridging the gap between the descriptive and the experimental approach and addressing different issues. How do new conventions and social norms spread in society? What is the role of reputation in competitive settings? How do socially desirable and undesirable behaviours emerge and become stable? We work to answer these and related questions, making AMB a fundamental tool connecting technology and society, and to shed new light on the complexity of human social behaviour.